I write this post as a memento for me. I will appreciate some feedback on building the VM on other Linux distro. 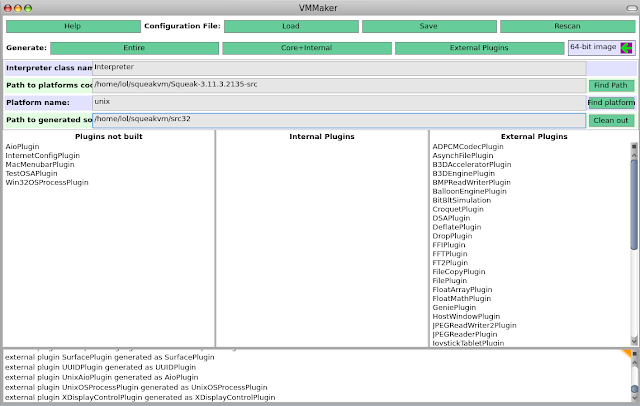 For more explanations on why VMMaker is needed and how it works, here is a good overview. To generate the source code for your own VM, you need a running Pharo image. Here I use a fresh Pharo 1.0-10508 rc2 image from Pharo website. 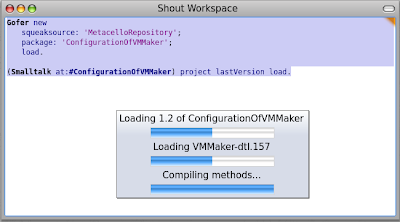 (Smalltalk at:#ConfigurationOfVMMaker) project lastVersion load. UPDATE: Should not be necessary now. See Javier's comment. In the Path to platforms field put the path to the extracted Squeak VM tarball: ~/squeakvm/Squeak-3.11.3.2135-src. Then right-click on one of the plugins pane and select make all external for a simple configuration. Note you can have a description of each plugin by reading the class comment.Classes are part of VMMaker-Plugins category. In path to generated source select a directory where the VM source will be written. Here ~/squeakvm/src32. Then click on the Entire button (top-left of window). Wait a moment, pray, and the code should be generated. Finally, I replace the original VM source with the generated one. Note: theorically this should not be necessary as the configure script accepts an option to specify the source directory path, but it doesn't seem to work. Thanks to this mail there's a patch to correct it. More informations on this error here.